A wave of sadness moved through me as I read the news of the passing of Disney Legend Jack Lindquist yesterday as I’m sure it did for many others whose social media feed was overwhelmed with tributes to his memory and vast accomplishments. After some experience as a child actor, Jack was hired by Walt Disney himself and served in many roles that helped shape the company and the guest experience. 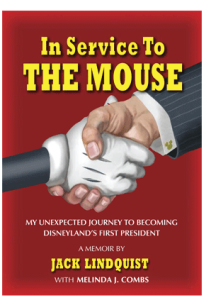 If you are not familiar with his resume just google his name and you will see that Jack Lindquist had an everlasting influence on the Disney brand you know and love today. One of the tributes I read said “Everybody loved Jack…” and even though I only met him a few times, I can certainly believe it. Each encounter, no matter how brief, brought a sense of great respect for the wisdom and humility he carried with him. 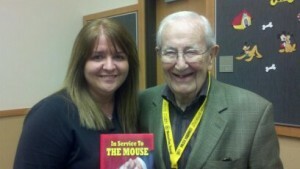 I was honored to spend time with him in 2011 at the Pacific Northwest Mouse Meet and at a informal dinner the night before the festivities. A small group of us stood around the kitchen among the finger food for a few hours listening to Jack and fellow Disney Legend Floyd Norman tell stories about the good old days. It was certainly one of the most entertaining Disney fan experiences I have had the honor or witnessing… Full of fun, laughter and reflection. We talked a lot about marketing and management in the Disney style. And was so happy when Jack graciously offered to sign a copy of his memoir ‘In Service to the Mouse‘ for me. It’s among my favorite possessions in my Disney geek collection. Its also about the privilege of meeting the characters, real and imaginary, famous and not so much, who can change your outlook or impact your day in a positive way with just a handshake, a smile, and yes a story. Jack Lindquist had heart. And I feel lucky to have met him along this path to hear a few chapters of his story. What Disney character, legend, etc – has influenced you? Next Article Everything Old Is New – And Even More Fun – Again! I enjoyed reading this, Beci. That’s so fantastic that you have such personal memories like this. Thanks so much Nicole. Thanks for taking the time to give it a read! Thank you for sharing these special thoughts and memories, Beci! I appreciate you stopping by and giving me the opportunity to share. What a kind and thoughtful tribute. Thank you for sharing this. I appreciate you taking a moment to read it and to comment.